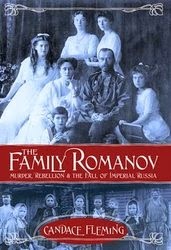 The Family Romanov: Murder, Rebellion, and the Fall of Imperial Russia by Candace Fleming. Schwartz & Wade, an imprint of Random House Children’s Books. 2014. Reviewed from ARC. YALSA Nonfiction Finalist. It's About: The story of the last Russian Tsar and his family. It begins with privilege, power, and opulence. It ends in a bullets and bayonets in a basement. The Good: Like many, the story of Nicholas and Alexandra fascinated me as a child and teen. The combination of the tragedy of their deaths and the young ages of their children (ages 13 to 21 at the time of the executions) with the mystery of Anastasia made this irresistible. My serious introduction to the topic was Nicholas and Alexandra by Robert K. Massie. What I like about The Family Romanov is that it doesn't just depict the world of the Romanovs. It also includes stories about the workers and peasants, to put into context not just the vast differences between the Tsar and those he rules but also to understand why a violent revolution happened. The Family Romanov portrays Nicholas and Alexandra as complex, complicated people. They are a young couple in love, who have a gravely ill son, whose love and loyalty survive. They love all their children, creating a protected world for them. Alexandra is deeply religious with a firm belief that prayers can cure her son. This leads her to Rasputin, and Fleming shows just why Alexandra was so willing to believe in Rasputin and his abilities. Nicholas believes that as the Tsar, he is and should be all powerful. At the same time, he's not an outgoing man or a micromanager: he is content to be with his family rather than in the seat of power. What struck me about Nicholas and Alexandra was how deeply they believed in their power and privilege due to their birth and bloodlines, but how little either had been educated or prepared to live up to that power and privilege and responsibility. Reading how Nicholas's war effort included sleeping in, good dining, and playing cards while his soldiers didn't have ammunition or clothes was almost impossible to believe. Except Fleming went into detail about the education being provided to their children, and how limited and sparse and undemanding it was, and the reader imagines that these two gave their children what they had been given. There were some things I wondered about, but it falls more under "this is a book that made me want to know more" than "this book failed to mention something" -- no one book can include everything. The family Romanov is Nicholas, Alexandra, and their five children. It is not his brothers or sisters, and it is not about his relatives. When I read about his sister Olga, I wanted to know how she survived, how she got out of Russia -- but that is beyond the intended scope of the book. I also wondered about Alexandra, a woman who loved her family but clearly wasn't meant for a public life. There was something sweet about her devotion to her husband, about their love match, about how close the family was. Yet, at the same time, she (and Nicholas) used that closeness as a reason to hide from the world and responsibility, it seemed, to everyone's detriment. Had they just been a rich family, it wouldn't have mattered -- but Nicholas was the ruler of Russia. And that wasn't a titular head, or in name only, only for important events. It was total, absolute control. Or as one person laments late in the book, "oh, how terrible an autocracy without an autocrat!" Because this gave me a fuller picture of the family, and provided a good background of their times, this is another Favorite Book of 2014.